On Tuesday, Jan. 30, “Real Sports with Bryant Gumbel” on HBO will debut “Episode 250: U.S. Olympic Pay Gap” in which the show will speak with current and former United States Olympians about the financial burdens that representing the United States in the Olympic games has placed upon them. Put simply, the USOC has been fleecing them in a manner that puts how college athletics in the United States takes advantage of their athletes to shame. NCAA-member institutions at least feed and house their athletes. The first athlete that the segment introduces is Jonathan Cheever, a member of the US Snowboard SBX team. Cheever says that he has had to finance the cost of his living expenses and qualification process, to the tune of $30,000. Cheever also stated that he did so using credit cards. For his work to represent the US, he has received health insurance and a $1,500 stipend from the USOC. Cheever’s experience is echoed by US snowboard slalom racer Mike Trapp. Both Cheever and Trapp work part-time jobs while training to pay the bills. When asked if he feels that the USOC will have played a part in his earning a medal if he should do so at the next games, Trapp didn’t mince his words. “No, [the USOC has] really done nothing to get me an Olympic medal,” Trapp stated. What might be easily dismissed as the grumblings of a few athletes who haven’t managed to secure the fame that other Olympic athletes like Michael Phelps have takes on new meaning when other facts are considered. The first is that the experiences of many US Olympic athletes are foreign to athletes from other developed nations. Trapp explained that when athletes from Asian and European nations learn that US Olympians largely have to pay their own ways, they are baffled. Other nations pay their athletes to train full-time. Evan Morgenstein is an agent for athletes in the United States and is featured in this episode of “Real Sports.” Morgenstein revealed that of the hundreds of Olympians he has worked with, at least half of them at any given time are flat broke. Morgenstein went as far as to call their standard of living below the poverty line. What makes the fact that US Olympians are living in poverty even more tragic is the fact that it’s not out of necessity, but a result of the greed of the USOC. “Real Sports” says that tax documents reveal that the USOC has annual revenues over $200 million, and is sitting on over half a billion dollars in assets from broadcast rights fees and sponsorships. As a 501c3 organization, the USOC pays no taxes. It seems that money goes to support everyone else involved in the organization but the athletes. In 2017, 100 USOC employees received six-figure salaries, led by CEO Scott Blackmun who received compensation of over a million dollars. There is some trickle-down to the governing bodies of individual sports. The 47 national governing bodies all have their own administration, who get a cut of that money as well. For example, the CEO of the US Ski and Snowboarding Association received a salary over half a million dollars last year. 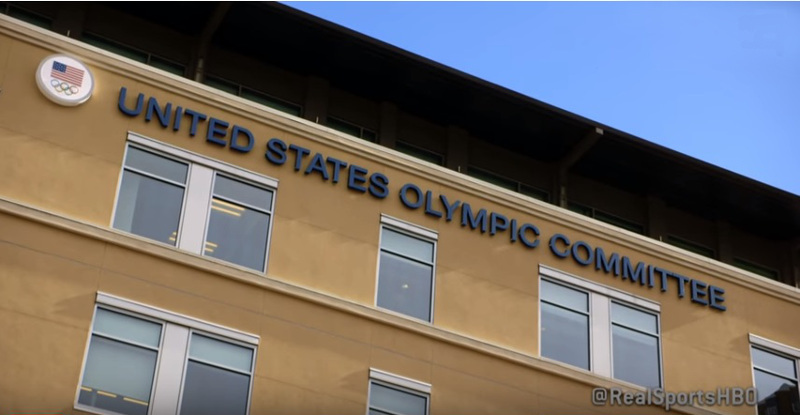 “Real Sports” estimated that a mere six percent of all the revenues generated by the USOC actually makes it all the way down the silo to the athletes themselves. Not all of the deck-stacking has been done by USOC, however. The International Olympic Committee has dirty hands as well. The IOC has rules that bar athletes from profiting off their own sponsorship deals during the games. Only sponsors who have paid money to the IOC can receive any exposure during the games, which includes the social media accounts of athletes. This not only handcuffs athletes from pursuing one of the only real means of making a living off their athletic abilities, but severely limits the field of potential sponsors who can front the kind of cash it takes to get an endorsement from the IOC. If any United States Olympians medal this winter, or in any of the following games, the USOC will plaster the images of those moments on its marketing for years to come. “Real Sports with Bryant Gumbel Episode 250 U.S. Olympic Pay Gap” is a great exposé which reveals that when the checks come in from sponsorship deals made off that marketing, it’s a strong possibility that the last people to see any of those dollars will be the individuals depicted.